We all love a feel good, great spring training season especially for the upcoming season. It's the fresh smell of cut grass, the sound of the crowd, and the cadence of a 'beer here' that we've all missed from the baseball season from last season. Looking back at the past two seasons, we've enjoyed quite a run with 2 more first place NL East finishes. We've have seen some of the most talented players in baseball on the Phillies for the past couple of seasons, and even seen the Phillies get the most wins of any season just last year. All of that feel good, sounds good stuff aside, the past two seasons haven't been that great when it comes to making it through the playoffs to the World Series. The Phillies have not met their goal of getting into and possibly winning another World Series since the '09 season, which they lost to the Yankees. The lack of great play in the playoffs is a cause for concern though. Just last year, it was a total collapse of the offense when the team needed it most. Talented players that just didn't have anything left to contribute to the team to take them all to the next level. Ryan Howard is coming off of a horrible injury. He had such a horrible contribution to the offense in the NL Division series in 2011, that it can't be ignored. Howard is getting paid megabucks to produce and he failed the team last year when it needed him to do what he is paid to do. Placido Polanco is another player who didn't produce in the playoffs last year. He batted the same BA as Ryan Howard, which was .105 - that is 2 for 19. The Phillies shipped World Series champion, Pedro Feliz off in an instant after the 2009 season for a 'perceived' lack of offense in the playoffs and World Series. Feliz batted .267 in the NLDS for 2009, .118 in the NLCS that year, and .174 with 2 RBI in the 2009 World Series. The Phillies dropped a pivotal Game 2 of the NLDS to the Cardinals at home last season in the NLDS. After winning the first game in Philadelphia by a score of 11-6, the Phillies could have really put St. Louis on the defensive by winning the second game, but it wasn't to be. Losing the 2nd game of the series at home essentially rendered the Phillies home field advantage useless. The Phillies dropped this game by a score of 5-4. They did face a tough Chris Carpenter in this game. Tony LaRussa was probably very happy to win this game 2 as the Phillies went with Cliff Lee. Lee was batted around for 12 hits and 5 runs, 5 of which were ER in the game. Lee did strike out 9 though, and the Phillies just couldn't find a way to win this. The Phillies rallied to win a Game 3 in St. Louis. Cole Hamels battled the Cardinals and came away with a win by the score of 3-2. Ryan Howard, Hunter Pence, and John Mayberry all went 0-10 combined in this game, and Placido Polanco finally got a hit, bringing his average to .083 in the series. 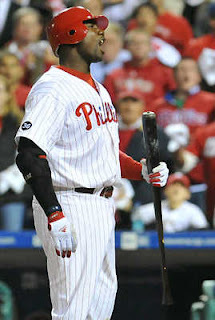 The hot player on the Phillies was Jimmy Rollins who at the end of game 3 had a .583 BA, and an OPS at 1.449 as well. The Cards again battled back, they won Game 4 in St. Louis and forced a Game 5 in Philadelphia. The Cards won by a score of 5-3 in Game 4 and hit Roy Oswalt around. Oswalt surrendered 5 R on 6 H and struck out 5. In the loss here, all of these players combined for an 0-15: Howard, Victorino, Ibanez, and Ruiz. Placido Polanco got a hit in this game, raising his batting average to .125 and Carlos Ruiz, who had been a really great player in the playoffs prior to 2011 for the Phillies, only had a BA of .071 for the series through 4 games.Ruiz finished up after the Phillies loss in Game 5 at Philadelphia with a 1-17 effort or a BA of .059, which is not what he is capable of doing. When you add all of the missed opportunities by certain players on the offense, it's easy to see how the Phillies did not advance further in the playoffs. Where they out of gas, turning in an awesome season with the highest win total by any Phillies team in the regular season ever? Perhaps. Game 5 was like a one game playoff, with the winner taking all. The Phillies again had the home field advantage and their best pitcher, Roy Halladay, facing the Cardinals best, Chris Carpenter. It was classic baseball. The game was won with a lone run, scored in the first inning by the Cardinals. The Phillies couldn't answer back, and the rest is history. Nearly the whole Phillies lineup was held hitless in this game, the whole team only managed to get 3 hits on the night. So it ended, one of the best Phillies seasons ever in the regular season was reduced to a final game in Philadelphia which they couldn't even draw a walk or steal for a base. These are the things that need to be looked at so they aren't repeated, and the same result is obtained. 2012 is a new season, a time for fresh starts, but not without a lingering look back at the lack of offense late in the season last year. The playoffs are a crapshoot (the best team doesn't always win). Howard batted .253 in the regular season. Is it that surprising that he batted .105 in a small sample of post season ABs? No.